This cover was designed to cover the modern precision rifle scope and optics, with additional cover to protect the barrel crown; providing extreme protection for your long gun. Three straps with side release buckles allow for securing the cover to your rifle; with crown cover adjustment option for various length barrels. 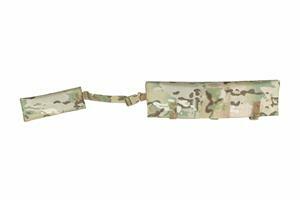 Also added is a 4”x4” VELCRO® brand LOOP patch, for adding a morale patch of your choice. Made with high quality Mil-Spec materials.